By selecting Install, you consent to the installation of RBC® Mobile¹, which gives you the simplicity and convenience of everyday banking no matter where you are or what you’re doing. You are entitled to and consent to future updates or upgrades to RBC Mobile, which may be automatically installed as per your device or operating system default or user-initiated settings. You may withdraw your consent by deleting RBC Mobile from your device. If you install RBC Mobile, then you must review, and are subject to, the terms and conditions found under the Legal link on www.rbc.com, in the Electronic Access Agreement if you are a personal client of Royal Bank of Canada with RBC Royal Bank Online Banking and the business account agreements if you are a business client of Royal Bank of Canada. You consent and acknowledge that RBC Mobile performs functions to access services like finding a nearby RBC Royal Bank® branch or ATM. A full list of the functions is listed at http://www.rbcroyalbank.com/mobile/app-faqs.html?q=85. For assistance with removal of RBC Mobile, access instructions at http://www.rbcroyalbank.com/mobile/app-faqs.html?q=86 or contact mobile.feedback@rbc.com. For information about digital channel privacy at RBC, visit http://www.rbc.com/privacysecurity/ca/online-privacy.html. RBC Royal Bank contact information is available at: https://www.rbcroyalbank.com/mobile/customer-service.html?tab=mail_tab. ®/™ Trademarks of Royal Bank of Canada. RBC and Royal Bank are registered trademarks of Royal Bank of Canada. ‡All other trademarks are the property of their respective owner(s). 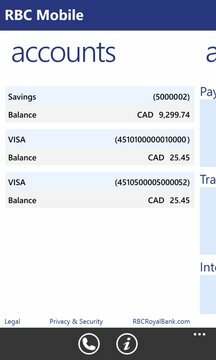 ² For a definition of an unauthorized transaction and for full details regarding the protections and limitations of the RBC Online Banking Security Guarantee, please see your account and/or online agreements with Royal Bank of Canada. This guarantee is given by Royal Bank of Canada in connection with its Online Banking services. 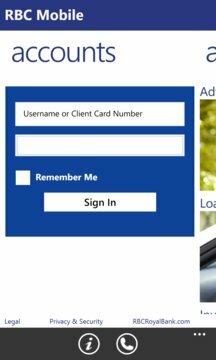 We thank you for your comments and welcome future feedback to improve our RBC Mobile app for Windows Phone 8 experience. 1 RBC Mobile is operated by Royal Bank of Canada.